UT Idea Lab | Kaleidoskoop winners! 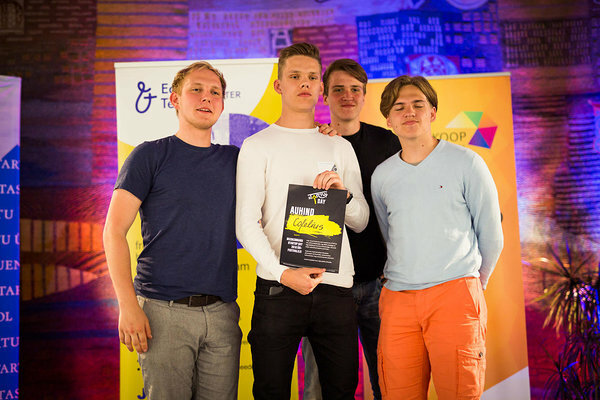 On 18th of May was Sout-Estonia’s biggest student business ideas competition Kaleiodskoop. Judges selected the best idea - CarZam! At the pre-selection, 10 teams were selected out of 19 to pitch at the Finals. 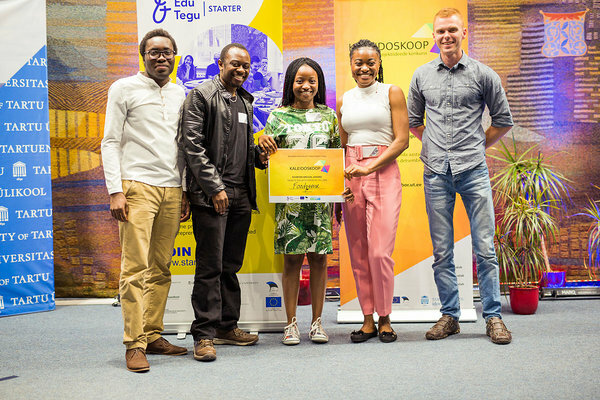 This year Kaleidoskoop was organized together with UT Demo Day. Team CarZam idea is to create a device that can be applied to a car's engine room, microphones and sensors track real-time sound and vibration of the car and will let you know if something is wrong with your car. The judges were Erik Puura (Vice-Rector for Development at the University of Tartu), Kei Karlsson (Co-founder of GoWorkaBit) and Siim Espenberg (The City Council of Tartu, Chief Specialist in Business Development). They said that the level of ideas was high because there were many science-based ideas. Kei Karlsson also said that it was a bit difficult to be a judge because teams were in different phases at their development. She also pointed out that this year instead of regular sales-people pitching you could see a lot of developers presenting their business ideas. 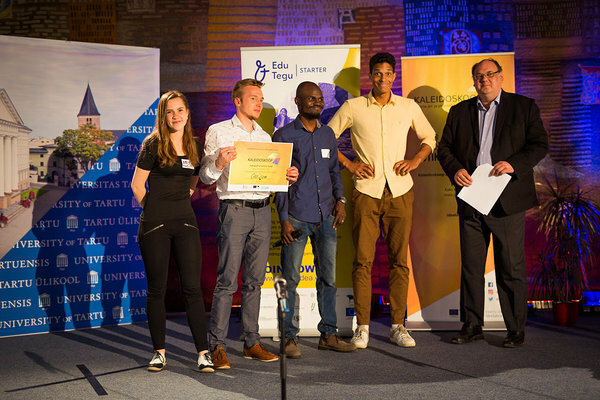 The winner team CarZam got an award to pitch at the business ideas competition „JA Europe Enterprise Challenge“ in Riga. CarZam has also finished STARTER Basic pre-incubation programme. Idea author Andres Kiik: „Today’s win gave us a lot of motivation to keep on going! Now the next goal is to make the first prototype by the end of the summer!“. Judges gave many special awards. Team Web Scraper (EstLat-Accelerate) and Foodyverse got tickets to business conference Latitude59 and student company Cofelius got tickets to next sTARTUp Day. 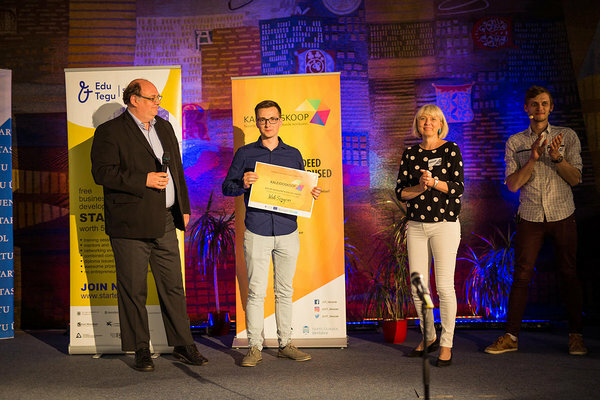 Tartu city government gave a special monetary award to team PowerUp Fuel Cells (EstLat-Accelerate). This year Kaleidoskoop took place already for the 10th time. Kaleidoskoop and UT Demo Day took place at the just-renovated UT Library. Next Kaleidoskoop pre-selection round is on 13th of December 2018 and Finals are at the sTARTUp Day on 24th of January in 2019 in Tartu. 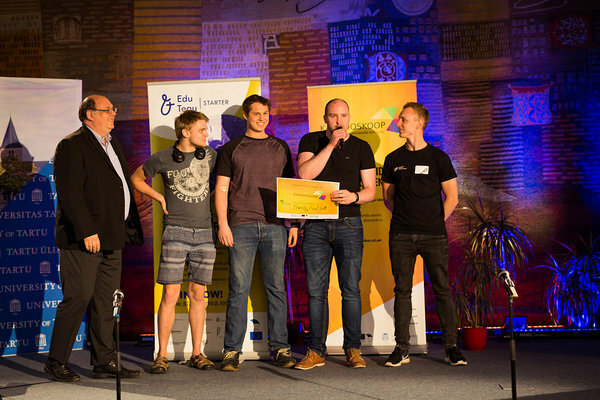 CarZam (Chance to pitch at the JA Europe Enterprise Challenge) - A device that can be applied to a car's engine room, microphones and sensors track real-time sound and vibration of the car. The device compares received data to fully functioning car and displays an error as soon as it occurs. PowerUp Fuel Cells (Tartu city government monetary price) - Develops hydrogen fuel cell electric generators offering an alternative to heavy batteries and noisy and unreliable diesel generators. Web Scraper (Latitude59 tickets) - Web Scraper is a web data extraction tool that runs in your browser. It also runs in the cloud to automate data extraction. Foodyverse (Latitude59 tickets) - A platform that connects people to share meals. We would like to connect people that love to cook with people that don't have the time or the means of cooking for themselves; all in an effort to socialize and share the cost of getting a homecooked meal. Cofelius (sTARTUp Day tickets) - Basically a tea bag which contains coffee, instead of a tea. EstLat-Accelerate programme is implemented under the European territorial cooperation goal of the cohesion policy and it supports cross-border cooperation. The programme is co-funded by European Regional Development Fund (ERDF), the Republic of Estonia and the Republic of Latvia.